Shopanthropic is on Social Earth! We are excited to be blogging for Social Earth, a socially mindful weblog focusing on businesses that are doing good through their work. Stay tuned for some exciting posts! We are offering 58% of Ethical Home and Fashion Accessories (a $60 value) for the next 6 days. You’re underestimating your couch cushions. Transform your sofa into a catalyst for social change with today’s ethicalDeal: $25 gets you $60 to spend on ethically-made, eco-friendly accents for your home, office and wardrobe from Shopanthropic.com. Toronto based, Shopanthropic, is offering ethicalShoppers free delivery within the downtown core. All the pennies you spend add up to some serious purchasing power – why not use it for something good. Shopanthropic invites ethically-minded consumers to put their dollars to work and shift their spending toward a positive impact. Their trendy ‘feel good’ items are made from natural, organic materials by talented artisan groups across India and around the world. Add some fair-trade flair to your fashion repertoire with a Hand Embroidered Cotton or Silk Scarves ($30.00+) or clutches and bags ($12+). Find beautifully crafted artisan necklaces, pendants, bracelets and rings to complement your outfit. 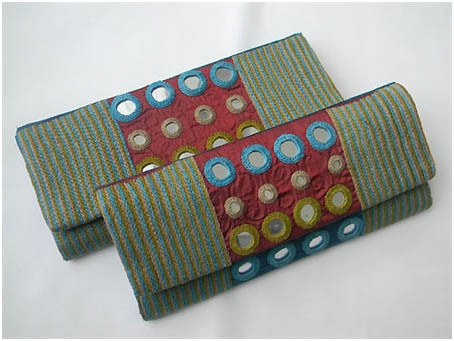 Decorate your home with colourful hand-crafted Cushion Covers ($30.00+) that support women in rural communities. Or gift someone an eco-friendly journal ($12+) with paper that has been created with the pulp from recycled scraps of waste textile. Shopanthropic does their part here at home too, lending their products to fundraising campaigns with local non-profits to promote social and economic development on the local as well as international scale. Accessorize in the inspiring style of social change with today’s ethicalDeal. So how does it work? First you go on the website, choose your city and purchase this ethicalDeal. Then starting June 7, choose your items online and enter your ethicalDeal voucher # in the promo/coupon code field. You can email info@shopanthropic.com to arrange for free local delivery within the downtown core. Otherwise shipping is a flat rate of $10.95 across Canada. It’s as simple as that! A reminder that this coupon expires October 6th, 2011. Check out the website here. So you might not be able to afford a Tom Ford Clutch worth $3,150 or a Hermès Bag worth $12,000 but you will be able to afford this new addition to our collection. This hand-embroidered Indian Silk clutch is made by women artisans in the southern state of Karnataka, India with the cooperation of a society actively involved with the local community in restoring the traditional art & crafts of the region. They are encouraging and training local ‘Lambani’ craftswomen and helping them in developing their traditional skills keeping current trends and styles in mind. By promoting and marketing their handicrafts, the society is playing a significant role in ensuring regular fair income to its artisans and improving the quality of life of these craftswomen. We are excited to be featuring products from Sandur Kushala Kala Kendra on our website now! Learn more about them! We are excited to be featuring products from Sandur Kushala Kala Kendra (SKKK), a cooperative that is reviving the traditional crafts of Sandur, and neighbouring areas in Karnataka, India, on our website now! What are your views on these 10 core beliefs – do you agree or disagree with them? What role do you play in the future of business, branding and advertising with a purpose? Discuss this and more at our first event taking place on June 16th in Toronto: Ethical & Fair Trade Products in the Marketplace – A discussion & networking evening. Ethical Products: Idealist or Affordable? A recent blog post on http://www.sustainablebusinessonline.com/ addressed the need for ethical products to be more competitively priced in the marketplace, to gain mass consumers. All of this brings up the question: are competitively priced, high quality sustainable products realistic? Is the process to making the product – sustainable? Is the process to making the product affordable? Is the product sustainable? Is the product high-quality? Is the product priced competitively? Is this price covering the cost it takes to produce the product including fair wages? Can this product sell? Can this product fit into mainstream consumer practices? If the answer to all of these questions is yes, then yes it is a sustainable business. However, if some of these answers are no – there is still much to be done. Do you think such a business is realistic? What other criteria do you see being necessary to determining how sustainable a business is? If you want to discuss sustainable business and ethical products further with others interested in this space, definitely check out our first event taking place on June 16th in Toronto: Ethical & Fair Trade Products in the Marketplace – A discussion & networking evening. What really makes an impact? Recently, Yves Saint Laurent debuted a special-edition tote bag, dubbed the Muse Two Artisanal Recycled Handbag, made out of recycled plastic bags. With only 60 of these limited edition babies out, this bag retails for $1720. What’s so special about the bag? It has been handcrafted by women artisans in Burkina Faso (West Africa) from materials like plastic bags and recycled cotton. In fact, YSL has an ultra-exclusive “New Vintage” line, which uses unused fabrics from their past collections. At first look, this seems like an inspired step for an influential fashion retailer. On closer look, you realize its only 60 bags – 5 dozen – and this doesn’t really seem like an impactful number. Is this a sign of low-confidence in eco-friendly fashion or a chance for a haute couture retailer to test the sustainable fashion waters? Will this really make an impact? Whatever their decision behind the insignificant number, I am excited on the step that they have taken. You might not have the financial resources or the social connections to snag one of these exclusive and iconic pieces – but you have the inspiration to find other ways to implement eco-friendly fashion into your life. If you are interested in discussing ethical and fair trade concepts and are in the Toronto on June 16th, make sure you check out http://ethicalproducts.eventbrite.com. Register now! For more information, visit http://www.ecouterre.com/yves-saint-laurent-debuts-muse-two-bag-made-by-african-artisans-from-recycled-plastic-bags/. Our first event in Toronto! On June 16th, 2011, we are excited to host Ethical & Fair Trade Products in the Marketplace – A discussion & networking evening at Network Orange (ING Direct Café) on 221 Yonge St. in Toronto Ontario from 5pm to 7pm! The evening will be the first event of its kind with a goal to encourage and promote conversations focused on the state of sustainable and ethical products in our marketplace today. Ethically-made or fair-trade products have had an established history in Canada, however, ethical consumerism has lacked significant momentum in gaining mass market presence. Our panel (which will be announced soon!) will be focused on the discussion of where this niche sector stands today and what must be done in order to achieve scale and mass market appeal. Consumerism can be used a tool to promote social change. Does the sector need to look at how traditional retail operates? Do fashion and industry trends need to play a greater part in ethical sourcing of products? What will it take to attract a larger group of consumers to go ethical? Location: ING Direct Cafe, 221 Yonge St. Spread the word, register for the event and we look forward to seeing you there! For more information, visit our website (www.shopanthropic.com) or check out our twitter at (www.twitter.com/enablechange). An exhibition in the US titled Paper Dresses Fashion Exhibition is giving the world a sample of an ultra-sustainable fashion product: paper dresses. Cheap, pretty, and wearable – these dresses would reduce the millions of tonnes of textile clothing that is discarded into landfills every year. Now this is 100% guilt free shopping, since they are cheap, environmentally-responsible, biodegradable, and easily disposable! The collection features pieces from 18th and 19th-century Japan and China, A-Line Souper’s from the 1960s and some modern creations. It is an interesting fantasy – walking around in paper clothing. However, if paper isn’t your material of choice – consider creations made through age-old artisan practices. There was a time when we didn’t have mile-high landfills and the concept of artificial materials. In our collection, fashion products like these Hand-Embroidered cotton stoles and this ‘I am Fair Trade’ Bag display hand-crafted fashion that is made of natural materials. These are materials that are easily available, often times bio-degradable and therefore easily disposable. So paper dresses may be a bit too extreme for you, but don’t fret, there are plenty of less extreme options (Check out our collection!) for you to buy pretty, wearable and environmentally-responsible fashion! These inmates and criminal offenders are referred to as sampah masyarakat, dangerous and useless to society. Even after they serve their time, they suffer from the stigma of having been on the ‘inside’. Now, they are learning a skill they will help them to create new and useful items that may help them improve their lives. Not only do they develop their skills, but they also have a savings account in which the proceeds of their handicraft sales are deposited. Prisoners learn to work in a routine, to work in a better environment and have a sense of accomplishment, while empowering themselves and their communities. In fact, one of the inmates, Narto, plans to open a small shop selling handmade patchwork clothes and handicrafts after he is released in 2012. Such a story is great inspiration to the power that social entrepreneurs have around the world and the difference a skill like creating handicrafts can make in people’s lives. Many of our products at Shopanthropic have unique stories like this one. So check out our products and experience the difference handicrafts can make in your life and in the lives of the artisans to create these beautiful products.